Outstanding staff and faculty members in the University of Wyoming College of Agriculture and Natural Resources were honored during the college’s annual Employee Recognition Program. Dean Frank Galey presented Outstanding Employee Awards to Kelli DeCora, senior office assistant in animal science; Ann Roberson, UW Extension administrative associate; and Holly Steinkraus, molecular biology instructional laboratory coordinator. Also nominated were Amy Boerger-Fields, veterinary sciences laboratory technician; Kelly Greenwald, administrative associate at the James C. Hageman Sustainable Agriculture Research and Extension Center; Carolyn Herman, staff assistant in the dean’s office; and Kassandra Thomas, plant sciences office associate. 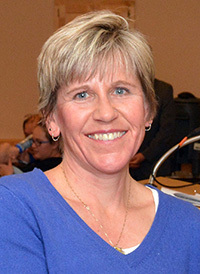 The Office of Academic and Student Programs honored Tara Kuipers, UW Extension community development educator, with the Outstanding Educator Award. Kuipers is based in Park County and serves northern Wyoming. Also nominated were Paul Ludden, associate professor, animal science; and Dallas Mount, UW Extension educator in Platte County and also serving southeastern Wyoming. Agriculture students presented two honors. Molecular biology Assistant Professor Dan Levy received the Lawrence Meeboer Agricultural Classroom Teaching Award. Molecular biology Lecturer Rachel Watson was presented the Outstanding Adviser Award. Meeboer nominations included Associate Professors Chris Bastian and John Ritten, agricultural and applied economics; Assistant Professor Erin Irick, family and consumer sciences; Assistant Professor Karen Vaughan, ecosystem science and management; and Lecturer John Willford, molecular biology. Also nominated for the Outstanding Adviser Award were Bastian; Kristin McTigue, lecturer, family and consumer sciences; Professor Kurt Miller, molecular biology; Associate Professor Dannele Peck and Ritten, agricultural and applied economics; and Assistant Professor Derek Scasta, rangeland specialist, ecosystem science and management. Mortar Board “Top Prof” recipients also were recognized. Recipients had been announced earlier in December. Family and Consumer Sciences -- Professor Michael Liebman was selected by Connor Morton, of Casper, and Associate Professor Rhoda Schantz was selected by Kaitlyn Livingston, of Newcastle. Molecular Biology -- Associate Professor Pamela Langer was selected by Kourtney Puckett, of Sheridan.